Our winery chef, Sarah Walz, loves the subtly sweet yet sour flavor profile that a sauce agrodolce lends rich, tender meats like duck breast. For this particular recipe, we turn to saba, a grape-based syrup that can best be described as akin to balsamic but softer, rounder and less acidic. If you can’t find a high-quality saba near you, Balsamic Reserve can serve as a palate-pleasing substitute. Although 2007 was our first vintage for EnRoute, we’ve been enchanted by Russian River Pinot Noir for nearly three decades. We’re clearly passionate about our wines. 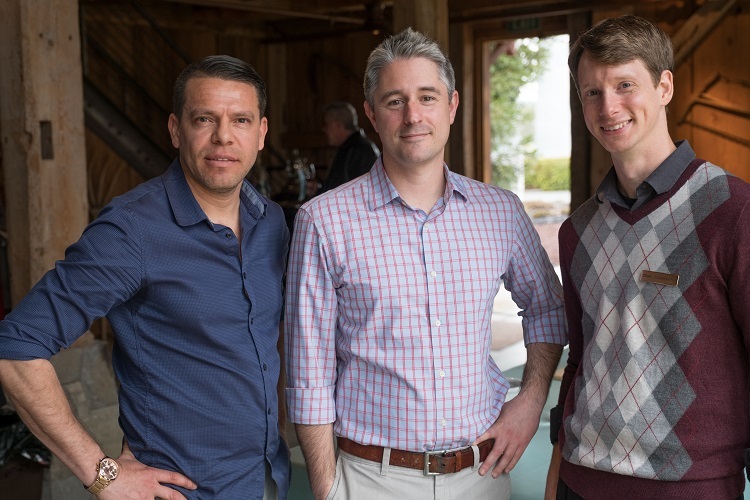 So, when our Napa Valley sister winery, Nickel & Nickel, invited us to hop over the county line and introduce our new single-vineyard Pinot Noirs during their annual Open House, the entire EnRoute winemaking team (yes, those gents pictured below) showed up to pour and talk about our passion for Pinot. In addition to our new single-vineyard collection, we brought the newest release of our flagship Russian River Pinot, the EnRoute “Les Pommiers,” to the Salon. This was the very first time we’ve poured all four of our EnRoute Pinots together at one event, and it was very exciting to taste them all side by side. The single-vineyard wines showcased the pedigree of their individual site, yet ultimately they underscored the greatness of our “Les Pommiers” blend. This month, we unveiled the debut vintage of our EnRoute Russian River Valley Single-Vineyard Pinot Noir: the 2013 EnRoute Amber Ridge Vineyard Pinot Noir and the 2013 EnRoute Northern Spy Vineyard Pinot Noir! These two vineyards comprise the backbone of our flagship Russian River Valley wine, the EnRoute Pinot Noir Les Pommiers, but they also make exceptional stand-alone wines. In her first year as a full-time member of the EnRoute Team, Cellar Worker Kamyn Asher proved she’s got the humor and drive to keep pace with the pros. Which came in handy during what turned out to be EnRoute’s most high-speed Russian River Valley harvest to date. Flowering is underway in the vineyards,and we captured this exciting stage of growth on a perfect spring day. In Green Valley, our Northern Spy Vineyard is showing beautiful flower clusters (second photo). Further north in Windsor, the majority of the caps covering the flowers in our Amber Ridge vineyard (fourth photo) are just about to pop off and stamens are about to emerge. Next up in the life of the grape is fruit set, when the berries begin to form.